To get this quest either talk to Zax in the Bounty office or Dia herself. She is located in the room next to your Hideout. Just bash in the door or use security to talk to her. The dark side solution is easy, just kill her and return to Zax for your reward of 105 XP and 300 Credits (400 if you persuade him). The light side solution is less straight forward. Talk to Holdan about it and either persuade him to take the bounty off, or pay him off. If you don't want to pay him, and don't have enough ranks in persuade to change his mind, you can wait until Bastila is in your party. 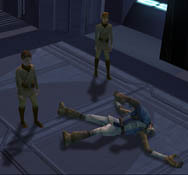 If you fail a persuade check Bastila will use her Force Powers on him to get him to change his mind for free. Once that is done talk to Dia for 125 XP. Refuse her reward for more light side points. You can accept her reward and gain a nice energy projector instead. Usually I take the reward even if I'm playing the light side, since you won't find very many energy projectors in the game. Not exactly a side quest, but some funny dialog to watch if you want. They just exist to scam. 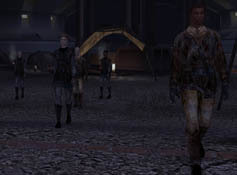 In the upper city cantina there are two con-artists, Christya for the males, and Jergan for the females. To trigger Christya, you must win a match against Niklos. Talk to her afterwards, and she will suggest you give her 20 credits for a drink. Of course she goes off with the noble guy leaving you with nothing. Typical. If you say you cannot afford 20 credits she'll just leave and go with the noble without stealing your money. If, on the other hand if you are female, just walk into the music room and Jergan will automatically approach you. He will ask for 20 credits to let you meet the band. If you say yes, he will run off and an angry woman will tell you that she was conned for 20 credits by the same guy. If you don't pay him he'll just stay there and wait for you to come back to try his luck again. There are no dark or light side points nor are there any XP gained. In the Bar area is a noble woman named Gana Lavin. If you talk to her she will mistake you for a waiter and complain. If you persuade successfully nothing happens, but if you don't persuade or fail, then she runs out angrily. The next time you leave the cantina she will be waiting for you with two thugs around the Equipment Emporium. The thugs are very weak, and will drop vibroblades and some other random stuff. Once the thugs are dead Gana will run off screaming. 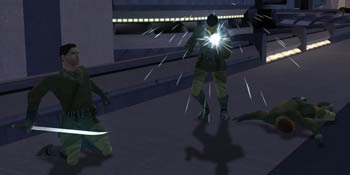 You begin this quest by setting up a duel with Ajuur in the Upper city Cantina. You should also know that it is best to use normal attacks as using feats decreases your attack bonus making it much more difficult to hit. All who are planning on becoming Light sided should try to finish this quest in its entirety as soon as possible because Killing Bendak Starkiller will net you some Dark side points. As you know the more light side points you have the greater the dark side point penalty, so by taking him out before you gain any light side points you prevent the dark side penalty from this quest from becoming too harsh to deal with. The reward is worth it, and I strongly advise all characters to take part in this quest whether they be light or dark. Not only are Bendak's Blasters the most powerful blasters one can get for a long time, you also get very nice monetary and XP rewards. Avoid gaining light side points by not finishing any of the remaining quests listed below, by avoiding conversing with the people that provide the light side quests until after you finish Bendak. Deadeye Duncan: Very Easy. Practically a 1 hit kill even on low levels. Gerlon Two-fingers: Easy. Just hack away and he should fall easily. Even Scoundrels shouldn't have too much of a hard time as long as you use a medpac. Ice: Medium. First match where you'll most likely use medpacs. Difficulty greatly depends on gear and levels. If you are level 5 with good gear, she's easy and you most likely won't even need to use a medpac. If you still haven't gone down to the lower city, this will be a bit more difficult. As long as you use medpacs you should still be able to win. For low level scoundrels you may want to use a concussion grenade and a couple of frag grenades to soften her up. Three frag grenades can knock her down, if she misses all of her saves. Even two grenades are enough to make this an easy battle for all. Marl: Medium-hard. Will lose often if you don't use strategy at lower levels. If you level up beyond 5 with good gear, the fight becomes rather easy. For an easy win on any level just run around and shoot at a distance. It will take some time but it's a sure fire win. Even a level 2 scoundrel can pull this off. Don't use attacks that take time. Rapid Shot or normal attacks work best here. Twitch: Hard. You can't use the run around strategy like Marl, so it's best to close the distance ASAP if you're going melee. Level up to at least 5 to make the battle easier. Concussion grenades and frag grenades speed things up considerably. Level 2 scoundrels will find this very difficult so don't be afraid to use concussion grenades to help you stun him to have your Sneak attack take effect. Use energy shields if you have to. Reward: 155 XP and if you don't use the glitch* 500 credits. *To activate this glitch, after winning the match against twitch don't talk to Ajuur. 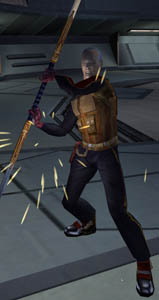 Go immediately to talk to Bendak Starkiller. 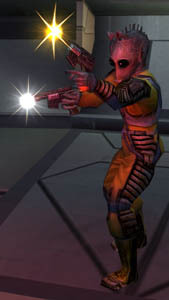 After defeating Bendak, talk to Ajuur twice to get the reward for killing Bendak twice as well as two Bendak's Blasters! 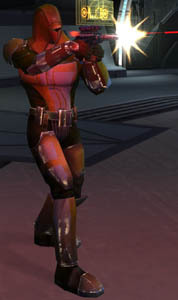 After winning against Twitch, to set up the next battle with Bendak, talk to him in the Pazaak lounge. Say that you'll take him on, and he'll set up a match. Leave the bar, go to Upper City North and then return to the Cantina. Now just talk to Ajuur and you'll battle Bendak! Note that when you start this next battle you will automatically get some Dark side points that cannot be avoided if you want to fight him. Bendak Starkiller: Very Hard. Easily the most difficult battle on Taris. It is possible to kill him as a level 2 scoundrel if you really truly want to, but it will take a lot of patience and perseverance. I actually found that he was far more difficult to kill as a level 2 scout, simply because once Bendak is stunned scoundrels can do sneak attacks, whereas scouts have no such benefit. Their minor increase in VP does little to protect you from Bendak's attacks, since in either case one hit will kill you. As soon as you are in the arena pause before the battle begins and use a dex, con, and a battle stim. If you are going to go melee use a str stim as well. Then activate an energy shield to protect you from his blasters. With all that done you may want to make a temporary save for your battle in the arena. Now chuck a poison grenade and then RUN! If you run fast enough his grenade will miss. Once he is poisoned chuck a concussion grenade. Now that he is stunned try to take down his HP as quickly as possible before he recovers. Hit him with everything you've got. When he recovers if he's nearly dead you may be able to kill him without using another concussion grenade, but most likely you'll need to hit him with a second one or maybe even a third one to finish him off. Remember this is IF your grenade hits. His saves are high enough that often your grenades won't affect him. Keep this in mind as you'll likely have to chuck more grenades. Don't use Sonic grenades as they do no damage. Cryoban and Plasma grenades work well, with good damage and best of all a chance to cast horror or paralyze, but you won't have very many at this point. It is imperative that you try to stun him as much as possible. Try to keep your vitality maxxed out and energy shields up constantly because if one of his hits doesn't kill you outright a second hit will. If your vitality gets low, get close enough that he chases you with his melee weapon without him pulling out his blaster, but keep just enough distance so he can't hit you; then heal while on the run. If you make one mistake though he could kill you in one hit as energy shields don't protect against vibroblade damage. In any case this is will be a long and difficult battle. Reward: 105 XP for winning along with the XP you get from killing Bendak. 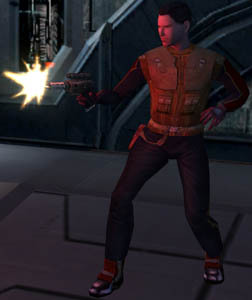 Also you get a Bendak's Blaster and either 700 or 900 credits if you successfully persuade or threaten Ajuur. Threatening Ajuur will get you some dark side points. Just complete the Dueling Ring and this quest is automatically completed. You must talk to Zax for your reward of 105 XP and 300 Credits (400 if you persuade him). When in the free clinic ask Zelka Forn about the crashed escape pods and then persuade him to talk to you about it. Threatening here never works, also Zelka will not talk to you about the escape pods after you've been to the Undercity once. Another way to get him to talk is by opening the door by either security or bashing. You can extort money from him for Dark side points. If you ask if you can help you get Light side points. The other answer is neutral (naturally). Get this quest by talking to Zelka Forn. He'll explain what Rakghoul disease is. Next Gurney will approach you and tell you to sell the serum to Zax instead for a hefty profit. Go to the south eastern corner of the Undercity near the entrance to the sewers is a Sith corpse. On that corpse is the Rakghoul Serum. No matter who you give the serum you will always gain 200 XP. For the most light side points refuse Zelka's reward, in which case he offers you a discount on his wares. You can still get the discount if you persuade him to give you more (though you don't get the extra LSP boost). If you threaten Zelka you'll still only get a mere 50 extra credits, so it isn't worth the hassle. Instead sell it to Zax for a hefty profit and some DSP. One thousand Credits (1500 if you can persuade him) is much better than the lousy reward Zelka offers you. You may want to use the serum in other sidequests in the Undercity before you give it to him. If you didn't use it you may want to purchase some from him afterwards. Using the serum in the Undercity does not affect this quest at all whatsoever. Also note that if you extorted money from Zelka previously (see above quest) then you cannot give him the serum. On your way to the North section of the upper city you may have met a merchant being hassled by some of Davik's bounty hunters. You can get both light and dark points here, or if you wish to save those points for later you can always bypass this event by walking as far away from them as possible when going to the north city. Just be sure you aren't wearing a Sith uniform when you do this as you will not be able to gain light or dark side points. The two thugs that you just killed both have 50 credits each allowing you to recover the amount you gave the old man if you decided to go with the light path. If you decide to go the dark path make sure that Carth isn't with you. He'll let the old man go before you can rob him of his credits. Finishing off the thugs will net you a bonus of 250 XP no matter what you do afterwards. In front of the entrance to the Upper City Northern Apartments is an Ithoran who is being bullied by some bigoted kids. If you save him you will gain 60 XP for your trouble. This event will not appear until you've been to the Lower City. Lecturing the children on equality, and then giving a medpac will net you the most light side points. While there are no dark side points to be gained, by not getting involved you can watch the kids kill the Ithorian, but that won't net you any XP. If Carth and Mission are in your party they will intervene even if you won't, and you can still get the XP, for a neutral solution. To get this quest either talk to Zax in the Bounty office, or talk to Largo himself. He is located in the Upper city Apartment North. To get the most Dark side points first promise you won't tell Davik for money. Talk to him again and then kill him. Return to Zax for your reward of 105 XP and 300 Credits (400 if you persuade him). For a light side solution, just give him 200 credits for a reward of 110 XP. Be sure to loot his corpse if you kill him for some credits and an energy projector! On your way to the Lower city elevator you'll run into a group of drunk guys. Again this group can be bypassed by passing on the south side of the walkway. Also same as before make sure you are not wearing the Sith uniform as that will deprive you of any light or dark side points that can be gained from this conversation. If you avoid fighting them you'll gain 60 XP. If you do end up fighting them then the Sith guards around will also help you. They might even drop a few credits each. Go to Droids by Janice and purchase the utility droid named T3-H8 for 50 credits, netting you 110 XP. After you exit her shop, the droid following you will short out and explode. Go back for a refund. With a high persuade you can get a 75 credits instead of the 50 you paid for. If you want dark side points hope that you fail the persuade check (must have less than Persuade of 8). Threatening her will succeed and will give you 75 credits and some dark side points. There is no light side path here but you can remain neutral. This "puzzle" is found in the Lower City East Apartments. Don't bother getting the data pad since I'll just tell you the correct order right here which is as follows: Elinda, Ujaa, Ujii Loopa, Fodo, Ashana. If you fail twice then the box will explode killing everyone. If you happen to survive the explosion a bag will be left with the contents of the box but you won't get any XP for it. Your reward is 110 XP and an Echani Fiber Armor and 50 Credits. To get this quest either talk to Zax in the Bounty office, or talk to Matrik himself. He is located in the Lower City East Apartments. Unlock or Bash in his door. You can immediately collect on his bounty (no dark side points strangely enough) or talk to him to help him with a plan to fake his death. To buy the permacrete detonator go to Kebla's Equipment Emporium and she should have one in stock for 50 credits. Return to him and give it to him for a short cut-scene. Remember to loot the container in the room before talking to him, as you won't be able to after you give him the detonator. You'll get 480 XP & LSP for faking his death. If you do kill him, make sure you loot his body for a mesh underlay. After he's "dead", either by killing him or his faking it, go to Zax to collect your reward of 105 XP (55 XP if you fake his death) and 300 Credits (400 if you persuade him). This "puzzle" is found in the Lower City West Apartments. While you can find the answers by reading the journal entries on the computer at your left, it isn't really all that difficult to figure it out. They are: Hyperdrive, My Uncle, Alderaan. You get 110 XP for opening the strongbox, 100 Credits and a Republic Mod Armor. To get this quest either talk to Zax in the Bounty office, or talk to Selven herself. She is located in the Lower City West Apartments. If you haven't yet received this quest you can still kill her by talking to her twice. You really don't have a choice but to kill her, but the rewards are substantial. Make sure you loot her corpse for a Scope, an adrenaline amplifier, and a neural band. Return to Zax for a reward of 105 XP and 300 Credits (400 if you persuade him) after the deed is done. In the Bounty office is a dancer named Lyn Sekla who is auditioning for a part with the Starlight Entertainers, but she doesn't have a partner to audition with and as a result cannot join. You can offer to be her partner, and although it requires a successful persuade check even people with no ranks in persuade can get a success after a few tries. You can purposefully fail if you wish but you get neither dark side points nor experience, so it is in your best interests to see her succeed. You can fail one of the three chances that he gives you, so it isn't all that difficult. Just do the following: Dance close beside her, Dance close behind her, and dance beside her, in that order. You gain 250 XP for helping her. To get this quest talk to the healer in the southern western corner of the Undercity village. Beyond the gate are 5 villagers infected with Rakghoul disease. Three of them will immediately transform as soon as you enter and you will be forced to kill them. If you want dark side points just kill the remaining two villagers for a bonus 60 XP. The Light path requires that you get the serum in the south eastern corner of the Undercity. Return to them with the serum and cure them for light side points, 210 XP (you only get 60 XP if you talk to the infected male) and the gratitude of the village. You must finish this quest prior to doing the light sided Promised land quest, otherwise the infected villagers will disappear along with the rest of the village. In the northeastern corner of the Undercity there is a fallen republic escape pod with an infected republic soldier. Watch out for mines in this area. As soon as you talk to him if you don't have the cure he will transform into a Rakghoul and you will be forced to kill him. If you got the serum in the southeastern corner of the Undercity then you can cure him and talk to him but he gives you no important information and soon dies thereafter from a random Rakghoul attack which you will have to face afterwards. So either you don't help him and take on one weak Rakghoul, or you do good and it backfires by luring four difficult Rakghouls toward you. Curing him will net you more XP, but it's more difficult to deal with those four so make sure you're prepared for them. There is no dark path here. This quest can be done both before and after rescuing Bastila, though the dialog changes. Rukil in the Undercity will initially ask you to find the journal of his apprentice. In the northwestern area of the Undercity near the Columns is an outcast corpse with the apprentice's the journal on it. Take it back to Rukil and you will be rewarded with 175 XP and he will ask you to find two more journals both of which are found in the sewers. Igear will also talk to you and ask you to bring him the journals instead. One is in the room with the spiderbot across from the Gammorean Compound. The other is found a bit south and east of the southeast entrance. Once you have both, return to either Rukil (light) or Igear (dark) for your reward. Rukil can offer you nothing, and once you give him the journals the entire Undercity becomes unpopulated, so you might want to do finish this quest after finishing with the Undercity, as even the healer and Igear disappear. Giving the journals to Igear will net you a bit of money and dark side points. In either case you get 325 XP for finishing this quest.